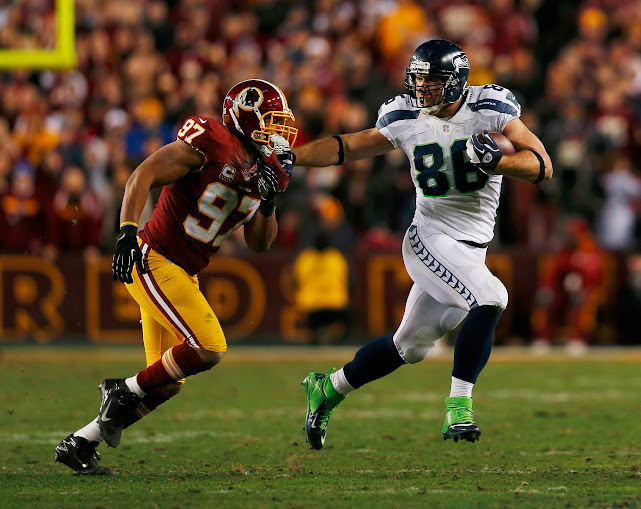 Among moves that some Seahawks fans want to see this year is an upgrade at the tight end position. In conjunction with that, some people want Zach Miller out at the position, especially following his torn plantar fascia in the playoff game against Atlanta. Miller, for his part, has been reasonably disappointing since signing a five year, $34 million contract before the 2011 season. Miller has been healthy enough to start 30 games in his two seasons with the Seahawks but has only caught 63 balls for 629 yards. In the three seasons he played with the Oakland Raiders prior to 2011, he surpassed 629 yards in each single season, and caught no less than 56 balls. Of course, the Seahawks offensive line struggles from the past two seasons have been well-documented, and much of Miller’s struggles can be directly attributed to his lack of routes run. Another thing potentially holding him back is quarterback play, as Tarvaris Jackson is a backup caliber quarterback, and Russell Wilson—no matter how good he was for a rookie—didn’t pass the ball nearly as much as the average offense. The Seahawks saw the emergence of Golden Tate and Sidney Rice this year also, and Doug Baldwin also received significant targets. Between all these things, Zach Miller’s fault in his own lack of production is arguable, and unlikely to be even mostly his¸but nonetheless it plays a role in his value to the team. Anthony McCoy, the Seahawks 2010 sixth round pick, emerged in the second half of the season and in the playoffs as he and Miller saw their roles in the passing offense reach the level that fans would expect from the position, considering the money spent there. Jared Cook is a free agent, and Jared Cook is a very good athlete. Cook is a wide receiver in a hybrid WR/TE body, a guy that can play H-Back and that can line up in the slot regularly. Unfortunately, Cook figures to expensive. He may be nearly as expensive as Miller was in 2011, and that creates some issues based on Miller’s present cap number. Miller is due to make a $6.8 million base salary this year. He’s got a $3.2 million roster bonus, and $3 milion in remaining prorated signing bonus that would count against the cap if he was cut or traded. In addition to that, $4 million of his 2013 salary is guaranteed, meaning that even if the Seahawks cut Miller before having to pay out his roster bonus he’d count $7 million against the cap. Miller’s cap number in 2013 is $11 million, meaning the Seahawks would save $4 million by cutting Miller, but likely couldn’t sign an upgrade at the position or less than a $4 million salary. Signing someone over that would mean an even larger allocation of money at the position. When the Seahawks signed Miller, his fit on the roster and the team’s potential to extract as much value from his possible both seemed limited. Using a lot of cap space on a tight end that mostly stays back and blocks, generally speaking, isn’t a sound cap utilization strategy, as those guys are readily available for a much lower price tag. That Miller is able to run routes and catch passes—a skill that was unapparent until the end of last season—could make him more valuable if the team’s offensive line and quarterback woes are as sewn up as we think that they are at this point. But if they’re not, the team has a much better opportunity to release him next offseason, when they’d be able to save $5 million, and only incur a $2 million cap penalty.